The Virginia Commonwealth University continues to expand. Specifically, the College of Engineering is significantly increasing its footprint with a new 133,000 square foot Engineering Research Building. The ground-breaking ceremony took place back in June 2018 for the facility that will add to the college’s laboratory space and support advanced research, economic development initiatives and hands-on approaches to engineering. Two VRMCA members have been actively involved in the project since November 2018. VRMCA-members S.B. 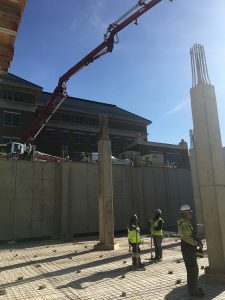 Cox Ready Mix, Inc. and Cleveland Cement Contractors, Inc. have been working together to supply and place 10,000 cubic yards of concrete for the foundation, slab on grade and metal decks. The $93 million project expansion was designed by Richmond-based architecture firm Baskervill and Smith McClane Architects and Boston-based Goody Clancy. It is scheduled to open in 2020.